On March 22nd, Stanbridge College welcomed the smiling faces of 6th, 7th and 8th grade students from Project Hope School and provided them with a campus tour of its Healthcare and Information Technology programs. The students, the majority of whom live in temporary housing and homeless shelters in Orange County, are members of the College and Career Club, a program provided by the Orange County Department of Education’s ACCESS (alternative education) district as part of their curriculum. 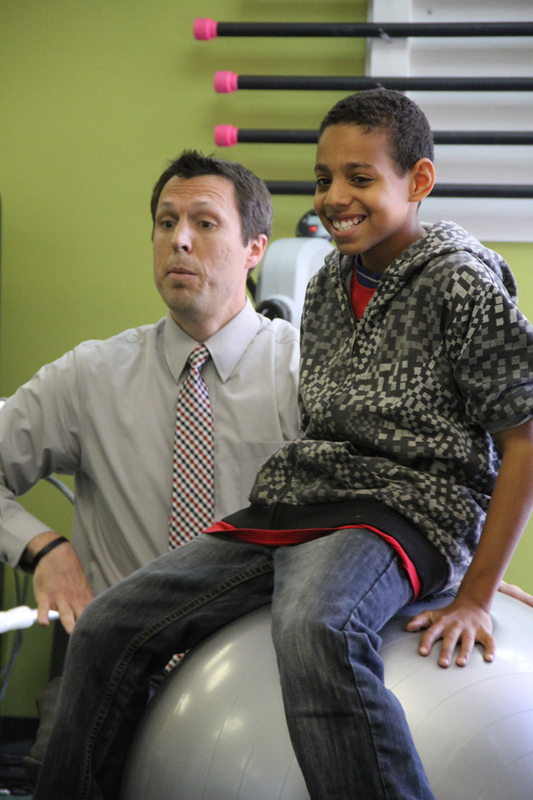 Project Hope School student sitting on an exercise ball in the Therapy Skills Lab, while PTA Program Director Dr. Scott Bennie, explains how physical therapists use them to aid patient mobility. At Stanbridge, the students were able to learn about different college and career options as they listened to presentations from faculty and staff in the IT, Nursing, Occupational Therapy Assistant and Physical Therapist Assistant programs and the Career Services department. This tour is the second field trip that Stanbridge College has hosted for the children of Project Hope School. During the tour, the Project Hope School students were able to explore IT classrooms and Healthcare Skills Labs on campus. In the Nursing Skills Lab, the kids were in awe as each one felt the pulse and listened to the heart beat of one of the many life-like nursing simulation mannequins. Members of the nursing staff demonstrated how Stanbridge students use these mannequins to learn clinical skills and bedside care. In addition to heart rates, the mannequins simulate breathing sounds, birthing, catheterization, tracheotomy care and other bodily functions and medical situations. In the Therapy Skills Labs, the students learned about the Occupational Therapy Assistant (OTA) and Physical Therapist Assistant (PTA) programs. OTA Program Director, Satch Purcell had a student volunteer help him demonstrate how an Occupational Therapy Assistant would assist someone who is injured by providing them with special equipment and tools for eating and grasping items like clothing. Mr. Purcell also showed the students a variety of equipment and stations in the OTA Skills Lab including the platform swing, simulation bathroom, rainbow arch and arm bike. Stanbridge College Vocational Nursing students donated a new color printer to the Project Hope School. who are physically injured and teach them to use assistive devices and exercise equipment including wheelchairs, walkers and exercise balls. The kids were able to experience what it is like to be in a wheelchair and learn how they would maneuver down stairways and ramps. At the end of the tour, Stanbridge College REACH, on behalf of the Vocational Nursing students of FTQ, presented a Canon PIXMA printer to the children as a gift to Project Hope School. 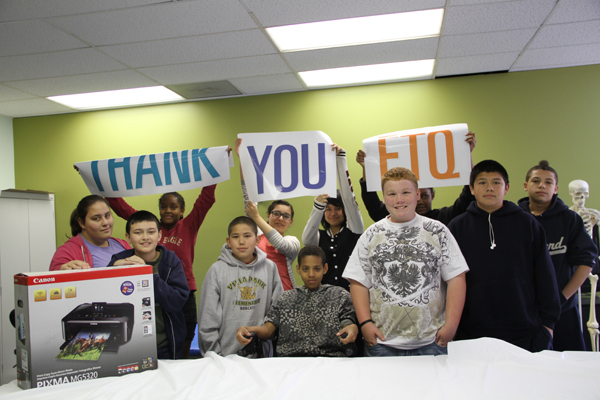 On their own initiative, the students of FTQ raised the funds to purchase the printer for Project Hope. For more photos of this event, please visit www.facebook.com/stanbridgecollege. To learn more about Project Hope School and how you can support the education of homeless children in Orange County, please visit www.projecthopeschool.org. Stanbridge College Hosts Vocational Nursing Career Fair on June 6th!